Our 7 day weather forecast for Lochearnhead updated throughout the day, making it ideal for planning leisure activities, travel and events. Read more about our weather forecasts. On Sunday 21st April 2019 the sun will rise at 05:56 and will set at 20:37. It will be a mild day, with temperatures reaching around 20.3°C. Today is expected to be a dry day, with a very low chance of rain. It will be quite a breezy day, with a maximum expected wind speed of 17mph. On Monday 22nd April 2019 the sun will rise at 05:54 and will set at 20:39. It will be a mild day, with temperatures reaching around 21.2°C. Today is expected to be a dry day, with a very low chance of rain. It will be quite a breezy day, with a maximum expected wind speed of 18mph. On Tuesday 23rd April 2019 the sun will rise at 05:51 and will set at 20:41. It will be a mild day, with temperatures reaching around 17.3°C. Today is expected to be a dry day, with a very low chance of rain. It will be quite a breezy day, with a maximum expected wind speed of 16mph. On Wednesday 24th April 2019 the sun will rise at 05:49 and will set at 20:43. It will be a mild day, with temperatures reaching around 13.8°C. Today is expected to be a dry day, with a very low chance of rain. It could be quite a gusty day today, with a maximum expected wind speed of 22mph. On Thursday 25th April 2019 the sun will rise at 05:47 and will set at 20:46. It will be a mild day, with temperatures reaching around 16.6°C. A few showers are expected, 3mm of rainfall is possible today. It could be quite a gusty day today, with a maximum expected wind speed of 23mph. On Friday 26th April 2019 the sun will rise at 05:44 and will set at 20:48. It will be a mild day, with temperatures reaching around 13.2°C. Heavy rain which could cause some standing water is expected, 13mm of rainfall is possible today. It will be quite a breezy day, with a maximum expected wind speed of 15mph. On Saturday 27th April 2019 the sun will rise at 05:42 and will set at 20:50. It will be a mild day, with temperatures reaching around 1.4°C. Today is expected to be a dry day, with a very low chance of rain. It will be a very clam day today, with a maximum expected wind speed of 11mph. Our weather forecast for Lochearnhead is updated throughout the day and has been found to be very reliable for planning activities such as days out, leisure, travel, events, fishing, golf and gardening. 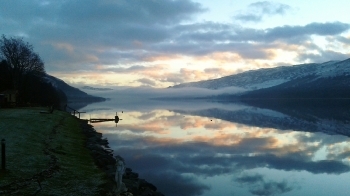 Lochearnhead luxury holiday cottage and a pet friendly self catering cottage on Loch Earn both sleeping 4. The three acre landscaped gardens include a loch garden for fishing and mooring with a slipway, summer house, picnic tables, putting and a Petanque Boulodrome. Fish for trout from 15th March to 6th October. The luxury cottage is spacious with; an open plan living area, WiFi throughout, wood burning stove, iPod docking, Sky TV and Sports, Glass doors and windows facing south over the loch and en-suite bathroom facilities. The cottages are within 300m of two hotels and there are many more within 10 miles. Excellent walks including a path from the village to The Rob Roy Way and National Cycle Route 7. St Fillans Golf club is at the east end of Loch Earn and there are Munro's nearby including Ben Vorlich accessed from the south side at Ardvorlich House. Loch Earn is very central within Scotland enabling easy day trips to many tourist attractions and some Scottish Isles. Popular day trips include; Rob Roy MacGregor's burial place in neighbouring village Balquhidder, The Glenturret Distillery and Famous Grouse Experience, Kelpies at The Helix. The Crannog Centre on Loch Tay, Oban and the Isle of Mull, Stirling Castle, Doune Antique Centre, Auchingarrich Wildlife Park and so much more. Briar Cottages are build on ancient crofting lands. Owners Kim and Fraser Proven will invite you to view the original cruck timber ceiling inside their thatched cottage. Request use of their hot tub on the grounds too. Lovely cottages in well kept gardens with exceptional views of Loch Earn, Edinample Castle, Glenample, Ben Our and Stuc A Chroin.